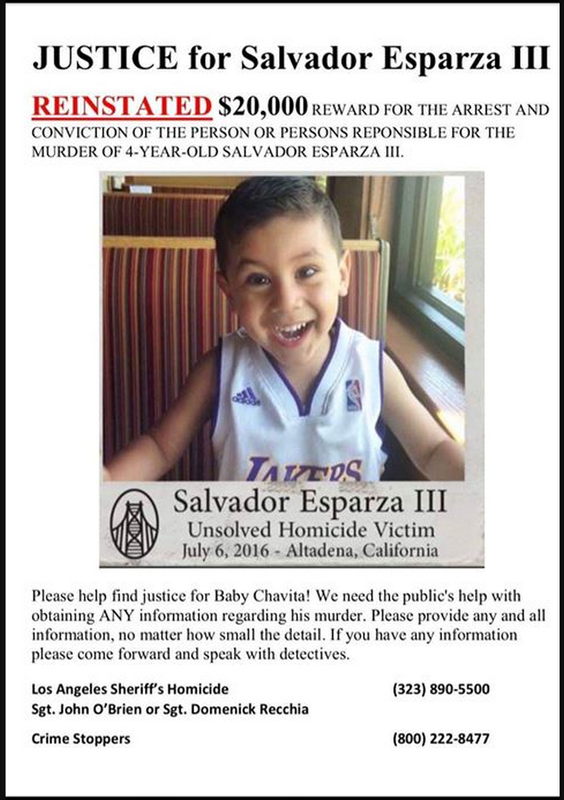 A $20,000 reward has been reinstated for the arrest and conviction of the person who murdered 4-year-old Salvador Esparza III on July 5, 2016. The Los Angeles Sheriff’s Homicide Bureau is asking for the public’s help with any information regarding the murder of the baby, who was shot and killed in front of the house on the 300 block of West Figueroa Drive in Altadena. 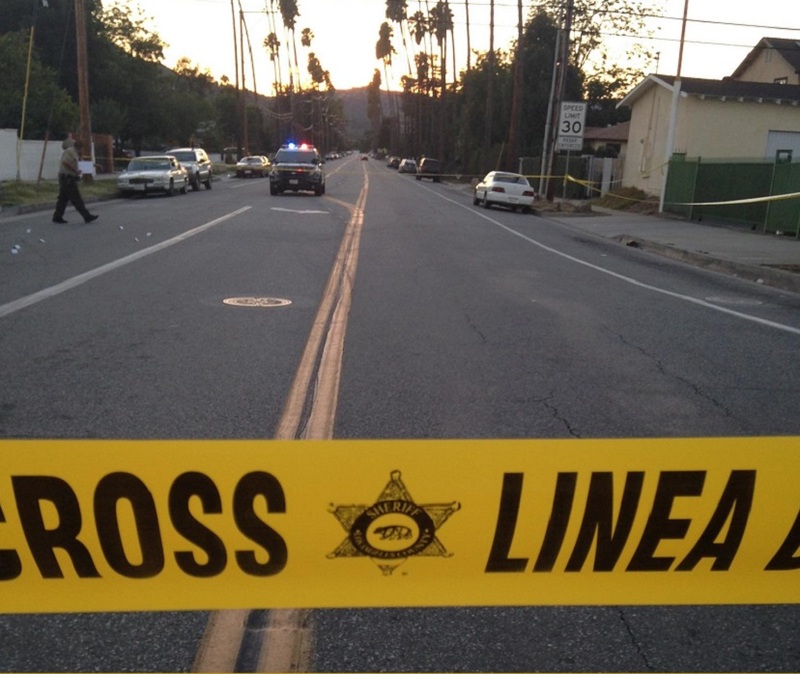 At around 10:30 p.m., the child was with his parents on July 5 visiting a friend’s home on the corner of Olive and Figueroa in Altadena when a suspect fired several rounds in the direction of the house which killed Esparza and injured a 27-year-old black male, an LA County Sheriff’s Dept. press release read. Detectives said the shooter was a suspected gang member who chased a 27-year-old man onto the property, shooting 13 rounds and hitting the man and Salvador. The child was struck in the head by a bullet and was killed and the man lived. 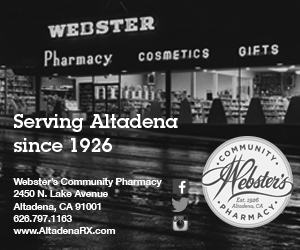 5:00 PM – A petty theft occurred in the 100 block of W. Altadena Drive. Stolen: brown Char-Grill smoker. 2:05 PM – A grand theft of landscaping equipment occurred in the 2900 block of Mount Curve Avenue. Stolen: (3) hedge trimmers. 2:45 PM – A robbery occurred at a business in the 2200 block of Lincoln Avenue. Suspect described as a male, Black, approximately 20-25 years old, 5 ft. 8 in. – 5 ft. 10 in. and 130 – 140 pounds. Stolen: currency. 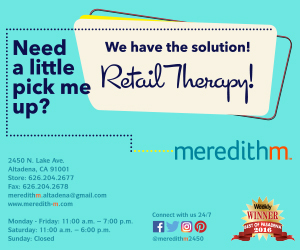 3:05 PM – A package theft occurred in the 3400 block of McNally Street. Stolen: package containing unknown items. 9:45 PM – A vehicle was reported stolen from the 2400 block of Lincoln Avenue. Vehicle described as black 2005 Lexus ES330. 10:59 AM – A trailer was reported stolen from the 1000 block of E. Woodbury Road. Trailer described as a white 1998 Rockwood M-204055 trailer. 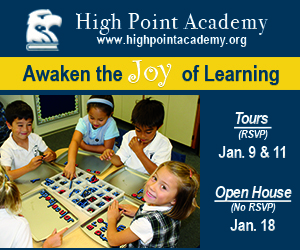 The occasion will feature a curated selection of student artwork from both schools. 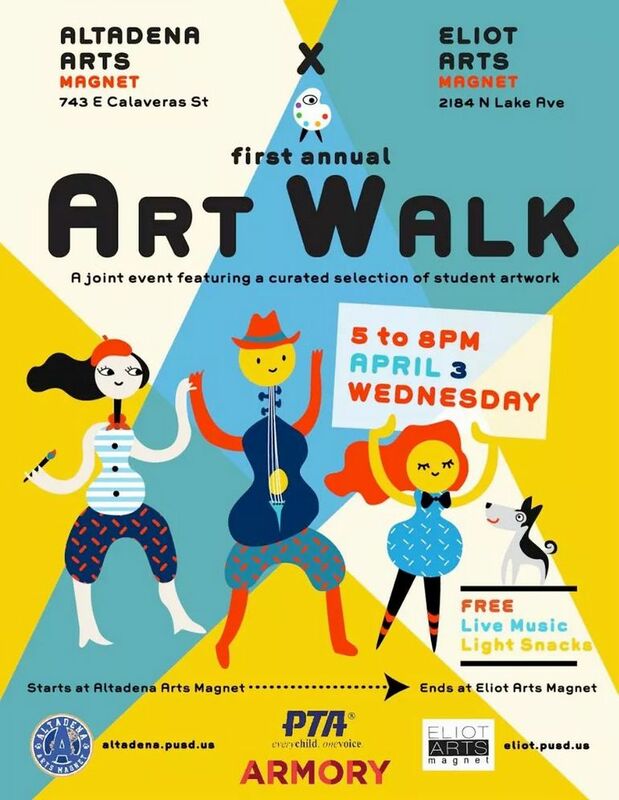 Regina Major, Arts Magnet Coordinator at Altadena Arts Magnet, said guests – including parents from both Altadena Arts and Eliot Arts – will begin their experience at 5 p.m. at Altadena Arts Magnet, at the corner of East Calaveras Street and El Molino Avenue, and stroll over to Eliot Arts Magnet, at East Calaveras and Lake Avenue. The event will also feature live music and light snacks, in addition to arts activities at both schools, she said. 3:00 PM – A cruelty to an animal and battery occurred in the area of Mount Wilson Road. Suspect described as a male , Black, approximately 63 years old, 6 feet, 220 lbs., with grey dreadlocks. No significant injuries were reported. 8:14 PM – A vehicle was reported stolen from the 2500 block of Santa Anita Avenue. Vehicle described as a gray 2010 Honda Accord 2-door. 7:30 AM – A residential burglary occurred in the 1500 block of N. Harding Avenue. Suspect(s) entered the residence by shattering the window. Stolen: collectible coins and currency. 3:00 PM – A vehicle burglary occurred in the 2100 block of Lincoln Avenue. Suspect(s) entered the vehicle by shattering the window. Stolen: silver handbag, cosmetic bag, and a necklace with white stones. 1:00 PM – A vehicle burglary occurred in the area of Chaney Trail and Brown Mountain. Suspect(s) entered the vehicle by punching the driver’s side door lock. 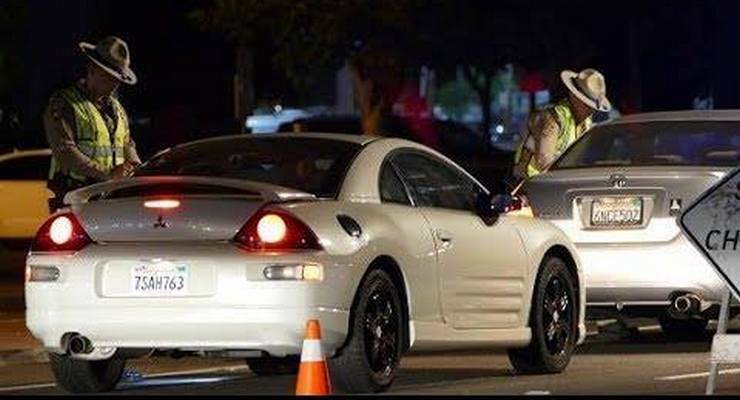 The Altadena Area office of the California Highway Patrol (CHP) will conduct a sobriety/driver license checkpoint on Friday, March 8th, 2019, within the unincorporated area of Altadena. “We would like to remind everyone to drink responsibly and to designate a sober driver. Driving while under the influence of alcohol and/or drugs is dangerous to everybody on the roadways and has cost the lives of too many people,” said Captain Tai Vong, Altadena Area Commander. The goal of the CHP is to ensure the highest level of safety, service and security to the people of California. Sobriety/Driver license checkpoints are proven, effective tools for accomplishing this goal and are designed to augment existing patrols. Unfortunately, we see an increase in the number of arrests and traffic collisions involving drivers under the influence during the summer. The California Highway Patrol will be diligently looking for DUI drivers, whether it be drugs and or alcohol. Be responsible; designate a sober driver. The objective is to send a clear message to those individuals considering to mixing alcohol or drugs and/or drive when unlicensed. Enjoy a special reading by the talented nominees for the Pushcart Prize for Poetry from the Altadena Poetry Review 2018 hosted by its editors, Elline Lipkin (Altadena Poet Laureate 2016-2018) and Pauli Dutton, with publisher Thelma Reyna on Monday, March 18, 7:00 p.m. to 8:30 p.m. in the Community Room of the Altadena Main Library. • Thom Cagle – is a native of Nashville, TN, and a graduate of Temple University in Philadelphia, where he studied poetry with Henry Braun. He is an alumnus of the long-running Wednesday night poetry workshop at Beyond Baroque in Venice, CA, and a past student of Laurel Ann Bogen. He makes his home in Santa Monica. 11:00 AM – A vehicle burglary occurred in the 1700 block of N. Altadena Drive. Suspect(s) entered the vehicle by shattering the window. Stolen: brown Michael Kors purse, pink Guess wallet, currency and personal documents. 7:17 PM – Porfino Guadarma, 61 years old of Altadena was arrested in the area of Fair Oaks Avenue and Woodbury Road for drunk in public. 3:00 AM – A petty theft from an unlocked vehicle occurred in the 600 block of E. Palm Street. Stolen: miscellaneous documents. 7:30 AM – A residential burglary occurred in the 200 block of E. Altadena Drive. Suspect(s) entered the garage by prying the door. Stolen: black Vizio television, black suitcase and food. 8:00 AM – A residential burglary occurred in the 3300 block of Raymond Avenue. Suspect(s) attempted to enter the residence by prying the window. 2:00 PM – A residential vandalism occurred in the 2400 block of Lincoln Avenue. Okorie Ezieme, Chair, Altadena Town Council has issued the agenda for the Council’s February 19, 2019 meeting to be conducted at the Altadena Community Center, 730 East Altadena Drive, starting at 7:00 p.m.
A pdf version is available by clicking here. Loud protesters reportedly including the mothers of several people killed during incidents involving law enforcement disrupted a Black History Celebration at Altadena Baptist Church on Sunday night. 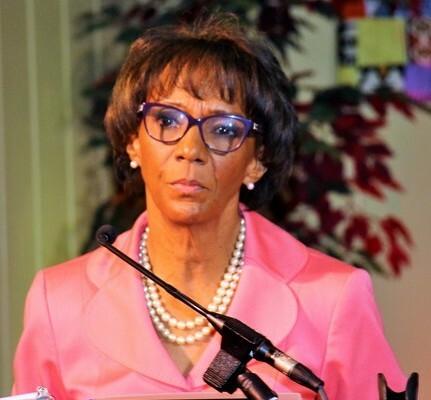 The incident occurred about 6 p.m. as keynote guest Jackie Lacey, the first African-American to serve as Los Angeles County’s District Attorney, was about to speak. About a half dozen protesters, some holding signs, began shouting and several walked down the sanctuary’s center aisle to face off with Lacey, who was surrounded by her security detail. Pasadena Black Lives Matters organizer Jasmine Abdullah Richards is seen and heard inside the Church’s sanctuary in video of the incident. The protesters are angry with the District Attorney’s handling of investigations into the deaths of nine young black men and two young black women during law enforcement confrontations. As the disruption continued, one witness said he saw members of the congregation wrestle away signs and banners from the demonstrators.